Your advertising budget can go a long way by advertising for free on other sites. While you can find numerous options online like Craigslist, you’ll want to make sure you post on alternatives for the widest reach. We curated a list of the most popular free online advertising sites to help get you started. Gumtree started out as a U.K.-based website but is now gaining ground and serving more locations throughout Europe, Australia, and the United States. Dubbed as the European version of Craigslist, the site offers free and paid ad services for almost all categories you can think of. 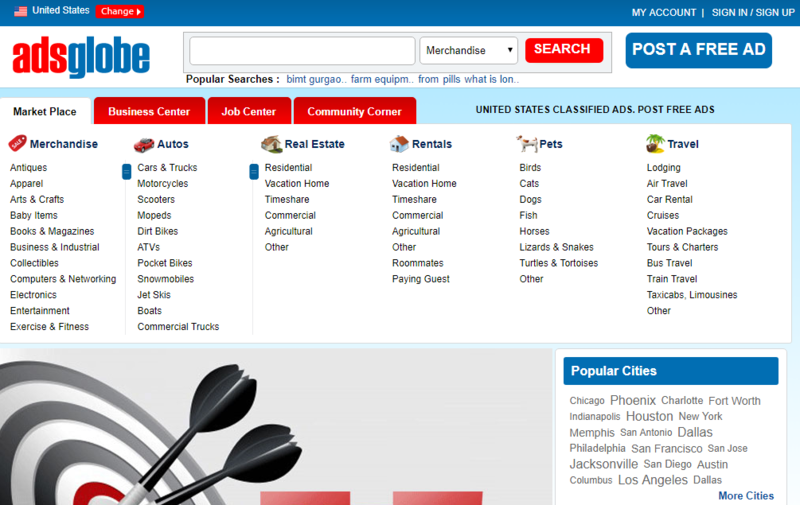 Classified Ads is a free site that’s very straightforward, with well-defined categories and a useful search bar. And because it’s simple and easy to use, the site is very active, which means more visibility for your ad. You can choose to post an ad first and fill out your account details later on. You can also add an HTML listing that links back to your website. Founded in 2006 and based out of New York, LetGo allows you to create classified ads for free as well as participate in forums available for different categories. The site lets you add images and videos while also giving you the freedom to share your listings on social media. One of the good things about Oodle is its compatibility with social media websites. You can link your Oodle account to your Facebook page to instantly update your status whenever you have new ads for items or services. The website’s look is simple and very clean, and it doesn’t look cluttered. This makes Oodle very easy to navigate and easy to use. 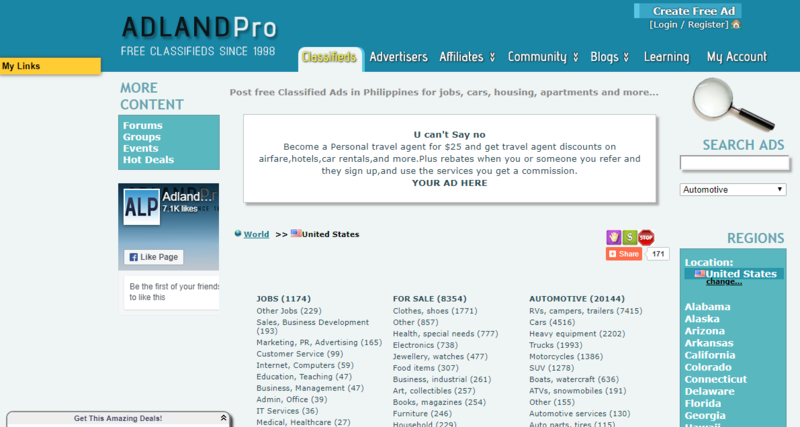 Adpost is another free advertising site very much like Craigslist, only with a more global reach. This is perfect if you want your ads to reach a wider audience for your listings or build an international network. While the platform can do with a little upgrading, the simplicity makes it easier even for readers with the most basic knowledge of the internet. There’s no denying the power of Facebook when it comes to networking. Having a large marketplace to host your ads guarantees a high potential of reaching your target market. Facebook recognizes this opportunity and has constantly been upgrading their platform for a more integrated buying and selling experience. It’s important to know how to maximize Facebook features to improve your marketing, including automated chat boxes that help you handle customer service more efficiently. 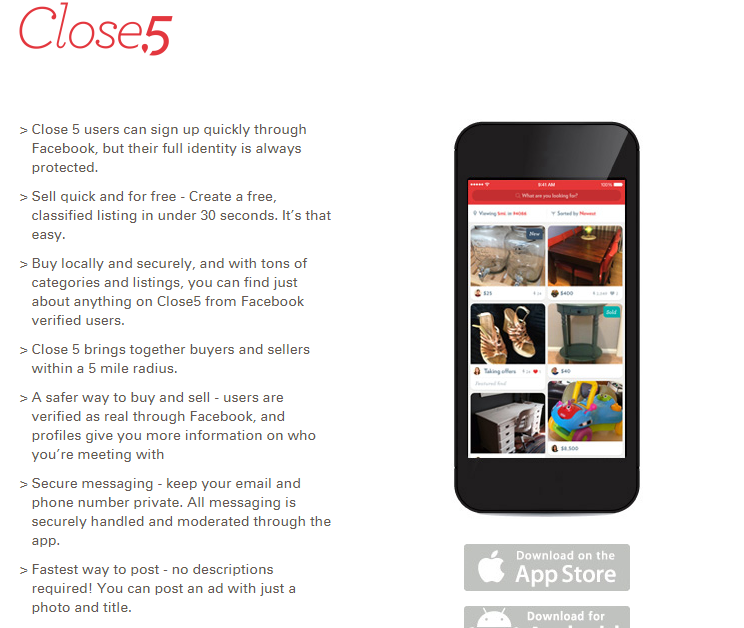 Close5 is a mobile platform that allows sellers to manage their products with their mobile device. This was created in answer to the increasing use of mobile devices among consumers to search for services and purchase items online. Transactions can be updated and completed on the go with the usual securities and features, including chat as well as the ability to utilize hyper-local capabilities to filter deals to only those within a buyer’s area. FinderMaster is an effective advertising platform for sellers thanks to its modern but still easy-to-navigate website, and the option to post your first ad the same time you register a new account. Almost all ad services are free with the ability to add photos and deal packages to entice prospective buyers. Hoobly is also a lot like Craigslist but with more security features. For one, this website requires registration via email instead of waiting until right before publishing an ad to ask for email verification. This helps to prevent accounts being linked to temporary addresses, which then reduces the risk of spam or potential fraud. 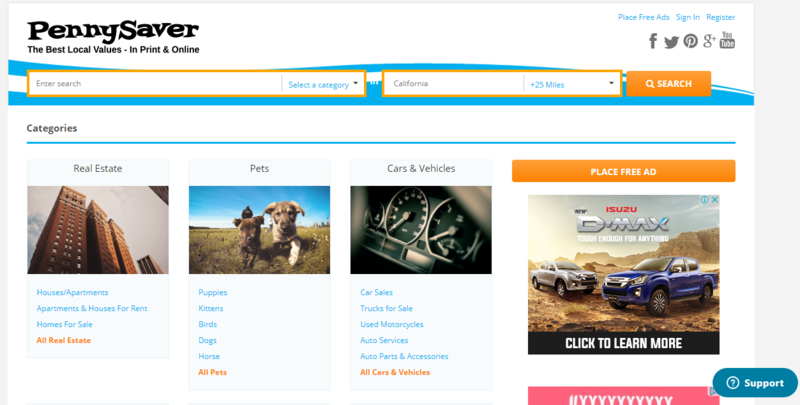 It is free to post an ad, and Hoobly offers a wide variety of categories that are available for browsing even before registering for an account. 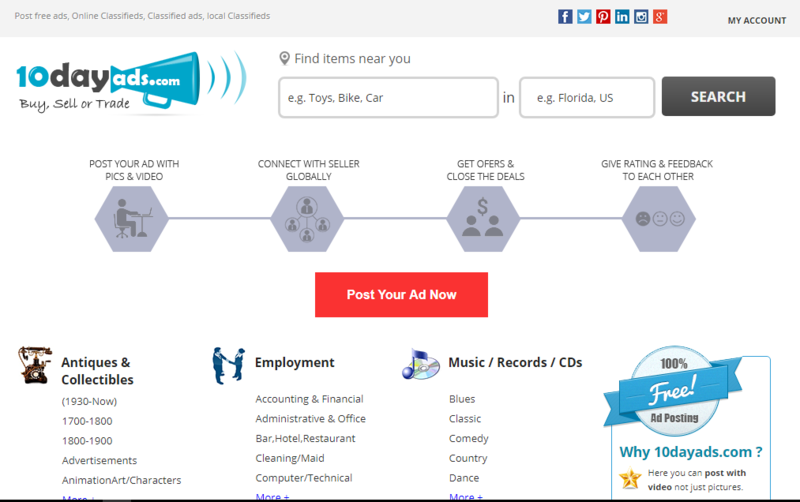 Locanto is a modern, online classified ads platform that lets you post for free. It offers a range of features that includes free ads that stay active for 60 days. 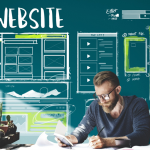 You can then enhance your ads by adding images, videos, and even HTML codes that link back to your website. It even has mini-analytics and social media buttons to improve and manage traffic to your ads. 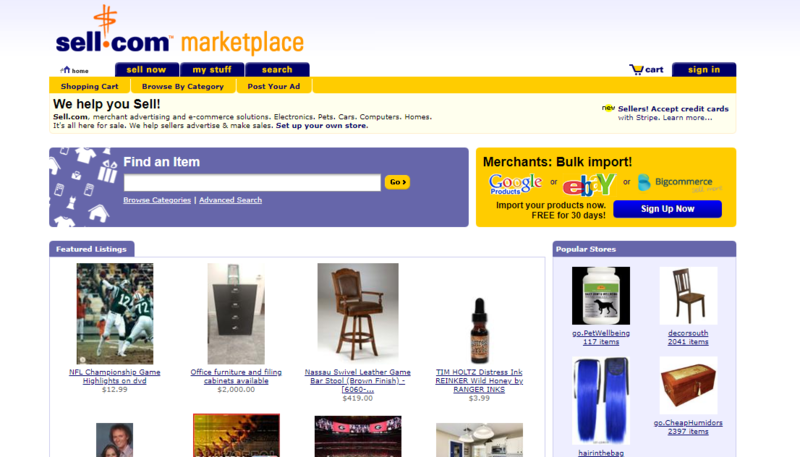 Aside from its modern website design, Sale Spider is notable for its collaboration with big names like Walmart, Macy’s, and Amazon.com. 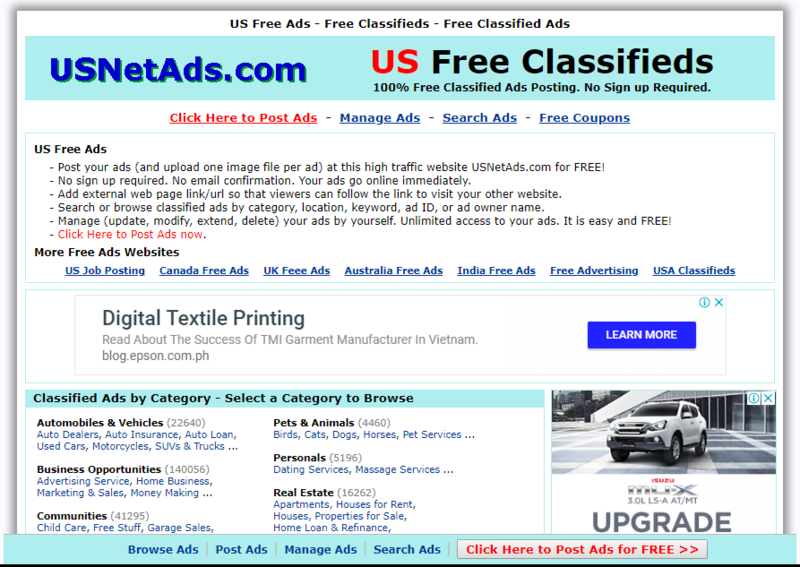 You can post an ad for free in their classified ad section and have it indexed in their well-defined categories. Aside from the free ad posting service, Sale Spider gives you an opportunity to network with other business owners through their forums. USNetAds.com does not require sign up and gives you unlimited access to your ad postings, though it only allows you to upload one image per ad. It also gives you the option to include a link back to your website. Users of the site can search with specific filters like location, keyword, ad ID, and even the ad owner’s name, so make sure you enter your details accurately. PennySaver is a great advertising option when you want a more localized target market. 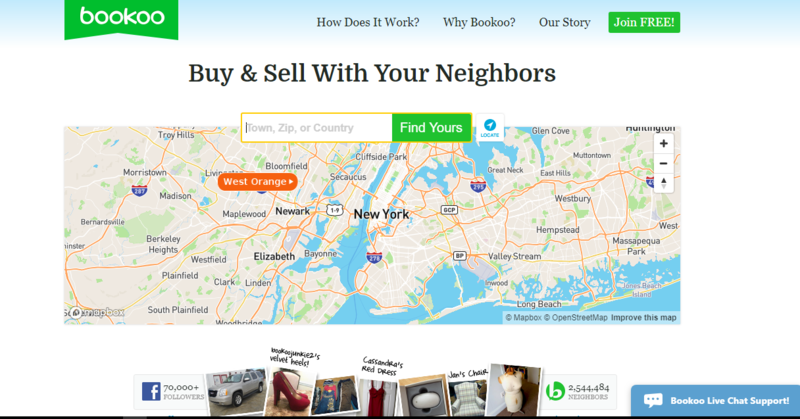 Their search bar allows for a number of filters, including location-based listings. What’s great about PennySaver is that once you register on their site, your ads also get posted on their affiliate and subsidiary sites based on the category of your ad. You can also get email reminders regarding your live ads and can cancel them anytime. 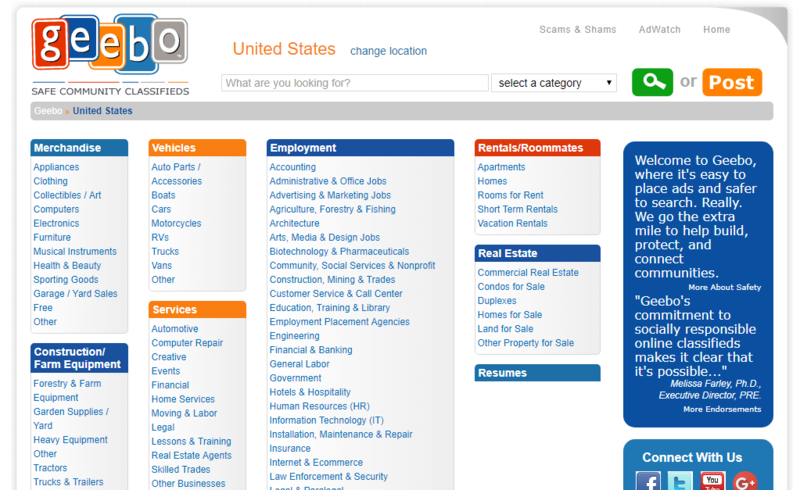 Sell.com began as a buying and selling website in 1999 but has since then evolved into a broader classified ad site that offers a wide variety of categories including jobs and services. They offer a free 30-day trial for all their merchant plans but after that, there is a monthly fee for as little as $10, which is enough to let you post 300 listings. Geebo prides itself as a safe community of classifieds where users can post anything from selling merchandise to looking for roommates to renting a house for free. You can also connect with them using your social media account. While not as popular as its counterparts, Geebo has been around for some time and has built itself quite a strong following. 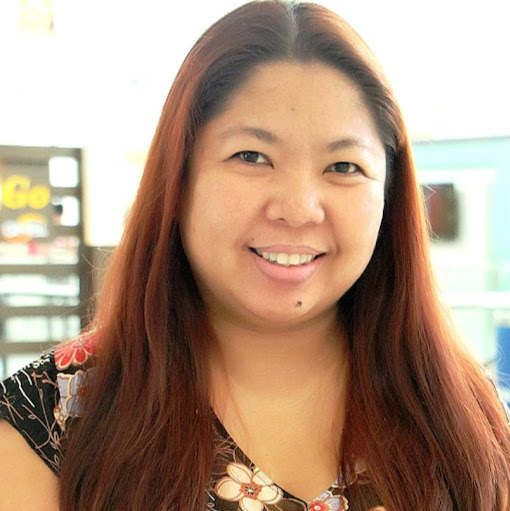 Bookoo markets its brand as a family-friendly alternative to Craigslist. This means being able to sell your items individually on the platform or announce a yard sale in your area. You can register for free, and you’ll be asked to create a profile that other users can view. It also offers live chat support, which is rare for free advertising websites. 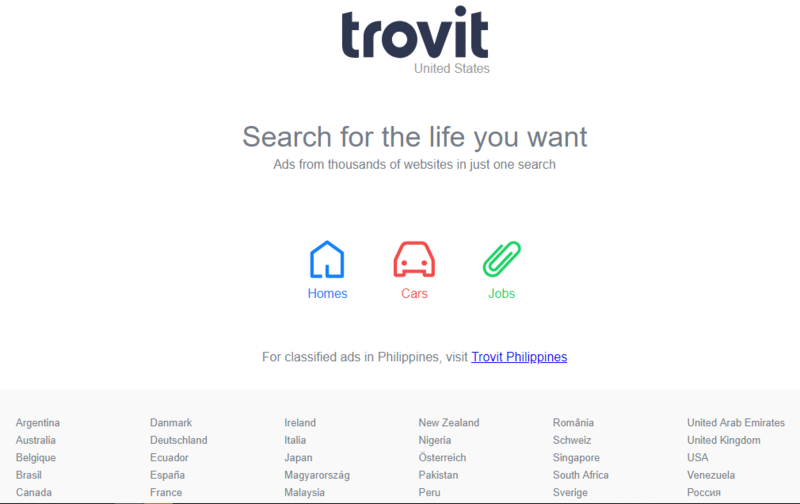 Trovit is a popular classified search engine for homes, automobiles, and jobs with results coming from a variety of portals for each market all over the globe. Although they don’t offer ad posting directly on their site, Trovit can recommend their partner classified websites to you based on your location, ensuring that your ad comes up in Trovit’s search results. AdLandPro offers free and paid advertising services in a very simple, straightforward ad posting process. 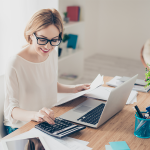 Registration is required but includes unlimited free ad posting within their wide range of categories, which include pets for sale, automobile repairs, and even apartment rentals. This website site is the classifieds arm of USA Today, making it a powerful tool and ensuring your ads are seen by key decision-makers and consumers all across America. 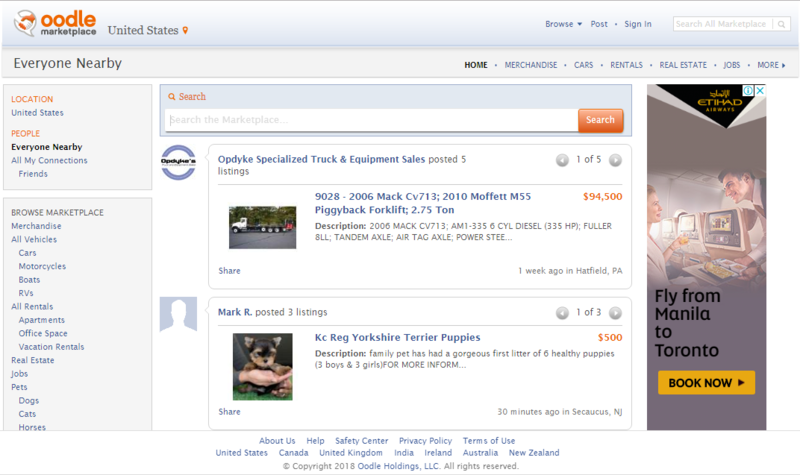 The categories are neatly arranged by tabs, which include auctions, notices, and travel. There’s also a marketplace section that allows you to include links to your ads on other websites. 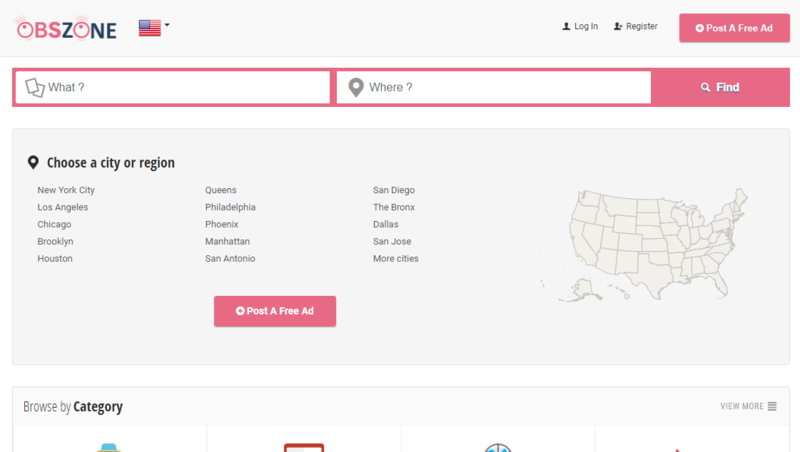 Adsglobe is a free classifieds website that automatically detects your location so it can immediately display your ads to users near your location. You can also manually change the location filter by using their drop-down list. The site will prompt you to sign up as a member in order to start posting free ads, which you can complete using your email or your Facebook login details. The 10dayads.com platform lets you include videos as part of your free ad and gives you the ability to post for a single or multiple locations the moment you click on their “Post Your Ad Now” button. What’s more, this website has an app for Android devices, making it easier and faster to complete transactions for users who are always on the go. They have a well-made website, with very helpful features to match the extensive categories that they offer to their subscribers. Like other fairly new classified ad sites, OfferUp was created with a matching mobile app to cater to its mobile users. They offer a five-star rating system to encourage sellers to build their credibility and a watch feature to let sellers monitor their items being sold on the platform. 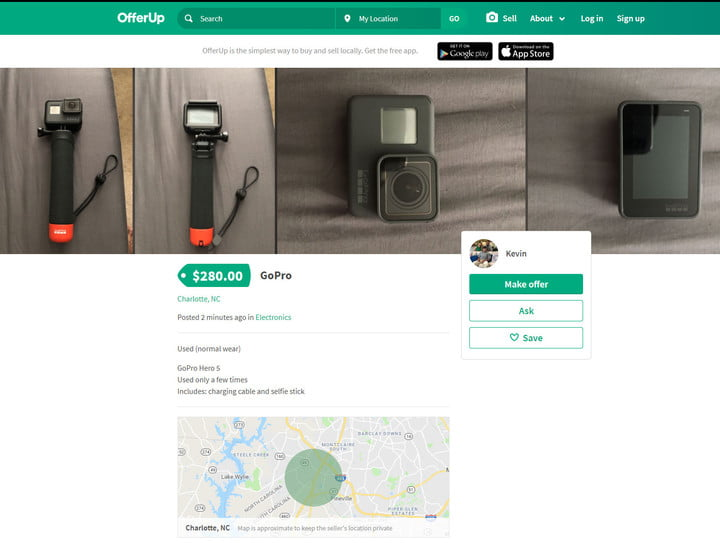 The most unique feature is OfferUp’s haggle option, where buyers and sellers can directly communicate to negotiate prices with each other. 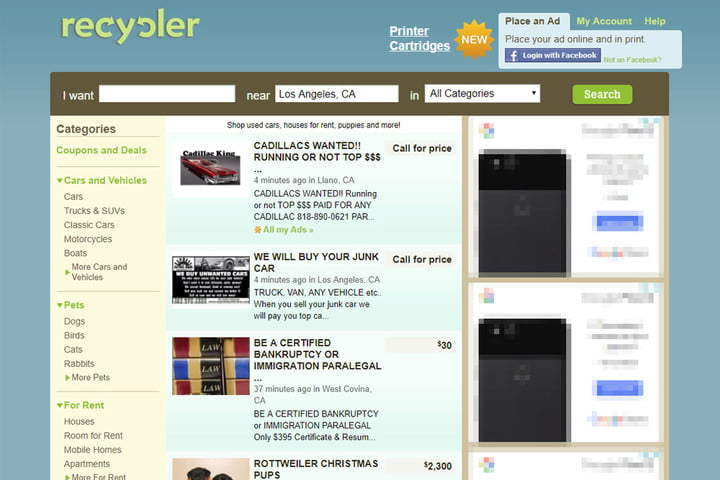 Recycler’s unique service is its offer to include your ad in print as well. They offer free ad posting, but there are fees if you want to get access to more features to improve your ad’s chances of standing out. The format of the website is pretty straightforward, beginning with a search tab that can be filtered by category and location at the top of the page. 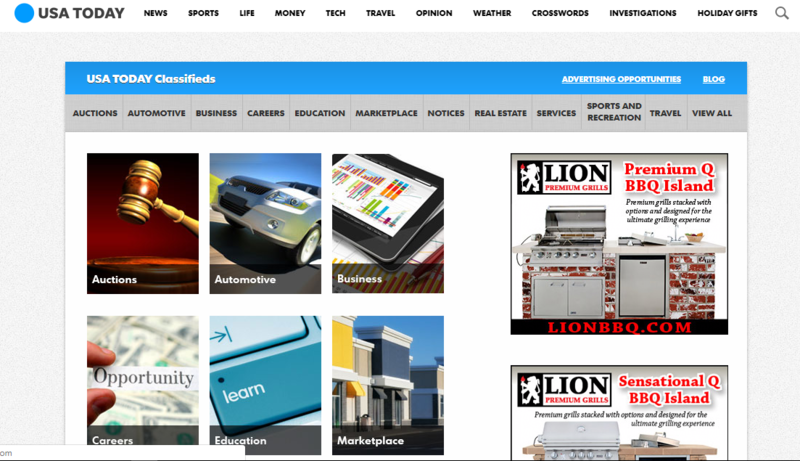 The right-hand panel displays paid or sponsored ads so they’re always available. NearbyMe2.com actively monitors and filters content on their website, giving users assurance that the ads shown are always up to date. What’s best about this platform, from the seller’s perspective, is it’s entirely free. Advertisers have full access to listings as well as unlimited ad posting. The website also uses interactive buttons and icons to give it a modern and engaging design for its users. Another newcomer to the online advertising scene, OBSZONE began in September of last year, offering ad posting services for free to 15 countries around the world. It has been receiving overwhelmingly positive feedback from its users in terms of content quality and user experience, so it’s been gaining good publicity and is highly recommended. Their services are free for local businesses and very easy to use. Investing in a smart advertising strategy is a key factor for improving any business. Free up your advertising budget by trying our list of popular Craigslist alternatives and become more visible to your target market. Did we miss out on your go-to free advertising sites? Share them with us in the comments.